1) GOP Debate Watch events in Zurich, December 16th plus more dates in 2012. Democrats Abroad Zurich will be holding a series of 'watch parties' during the Republican presidential primary debates at the American Women's Club Zurich. In this first event in the series, we'll watch the December 10th debate from Iowa. Feel free to join us, bring your non-American or non-Democrat friends! We welcome everyone to join us for friendly discussion and, perhaps, a few laughs! Snacks and drinks will be provided by AWCZ for a small charge to help cover expenses. 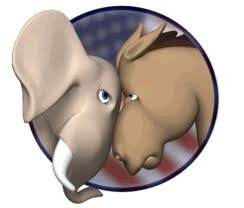 At the second in the series we will watch the January 19th debate broadcast on CNN. Mark your calendars and look out for more details in the New Year! Mark your calendars for March 9th (TBC) for next debate watch! There is an interesting opportunity that we wanted to share with you. 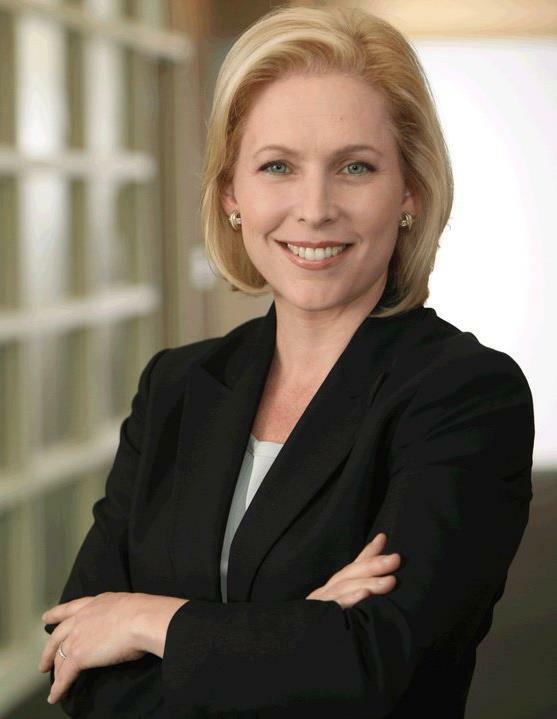 Senator Kirsten Gillibrand, the junior Senator from New York, is coming to Geneva on January 10th. Whether you are from NY or not, it is unique to be able to spend time with a Senator in an intimate setting, so this is why we are passing on the news about this fundraising cocktail to be held in Geneva on January 10th, in case you are able to attend. Bring your families out for a fun day of bowling with Democrats. Meet other Americans, win great prizes, find out about registering to vote in 2012! RSVP: events@democrats.ch by January 12th or until booked up! Hurry! Don't delay; the lanes will go fast! You can sign up as an individual or as a team. Lanes reserved by Democrats Abroad but each person pays bowling ally directly for games. THERE WILL BE PRIZES FOR TOP SCORES: INDIVIDUAL, TEAM AND KIDS! American-Swiss journalist and author Edward Girardet is one of the world's foremost experts on Afghanistan. 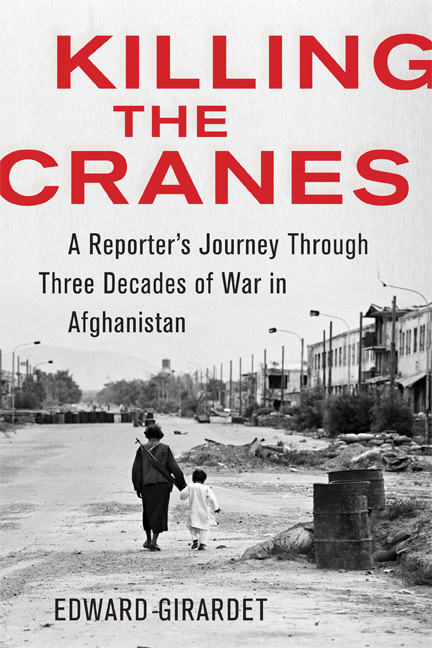 His recent book Killing the Cranes: A Reporter's Journey Through Three Decades of War in Afghanistan details his experiences and encounters in Afghanistan over the past 30 years and sheds light on the reasons for the West's failures in this country. Ed will share his profound insight into Afghanistan ranging from politics and development policies to aspects including reconstruction, military, humanitarian, agriculture and human rights. We look forward to a lively discussion with Democrats Abroad members on January 19th! Where: Home of DA member in Commugny (VD) near Nyon. Address and directions provided on RSVP. What: Potluck dinner – please let us know if you can bring a dish to share. RSVP: events@democrats.ch - space is limited. If you would like to read Ed Girardet's book, Killing the Cranes, Payot carries it in Switzerland or order online. Read more about Ed and his book at The Essential Edge Geneva. We had an exciting and busy fall in Democrats in Switzerland. As we round down the year, here are a few highlights of what we've been up to and key dates to look forward to in 2012. In October there was an international meeting of Democrats Abroad in Washington, DC. Four members of DA Switzerland attended these meetings (at their own expense). We participated in workshops and discussions on media relations, events, fundraising and voter registration. While in DC, we were joined by DA members from some of the 50 other DA country committees around the world to lobby on issues important to us. For 2 days we held more than 30 meetings with members of Congress and their staff. Our primary brief was to discuss the tax reporting issues known as FATCA and FBAR, the recent change to US immigration rules concerning the I-130 form, and to encourage adoption of the Uniting American Families Act. Since returning, I have joined a small task force to continue to work specifically on the FATCA and FBAR issues. We plan to report to DA members of our progress in the coming months. October also saw the elections of new leadership for the Zurich Chapter with an enthusiastic call from Chair, Renee Rousseau, to mobilize in the German-speaking region. Contact Renee if you want to get involved in the dynamic new team to get out the vote for 2012. Come out for one (or all) of the GOP presidential debate watch events coming up. These past couple months also brought several VIPs to Geneva. Many of us spent an inspiring evening hearing the inside scoop on Barack Obama's campaign from his campaign director, Jim Messina. And just last week Governor Tim Kaine joined Americans for a fundraising evening during Geneva's Escalade where we shared fondue and he shared his views on the state of the country, the presidential race and his own campaign for Virginia's Senate seat. It was without doubt one of the most informative and motivating campaign events we have had yet and we all wished we were Virginia voters! Also last week, DA was given the opportunity to invite 200 of our members to attend a speech by Secretary Hillary Clinton at the United Nations in Geneva. With an incredibly short deadline, we rallied our most active members and were able to send a list of 200 confirmed guests to take part in witnessing an historic speech by our Secretary of State condemning the discrimination of LGBT people and promoting gay rights as human rights around the world. This is a day many of us will never forget. We now look forward to an exciting and important year ahead of us. While the GOP candidates for president battle it out, we are building a strong grassroots movement to Get-Out-The-Vote. We will be phone-banking each of our members starting in February 2012 when the www.VoteFromAbroad.org website is re-launched with a fresh look and great new features. Look out for volunteer opportunities! Over the weekend of January 27-29, DA leadership from EMEA region will meet in Strasbourg, France for our Annual Regional Meeting. This meeting is open to all members so if you want to get involved, meet great people, and attend workshops on Voter Registration, Social Media, Young Democrats, the 2012 Election Landscape and more, contact me for more information. Mark your calendars for May 3, 2012 when Democrats Abroad Switzerland will hold our Global Presidential Primary election in Geneva. I hope you will all come out to vote in person or by fax/email/post. This will be your opportunity to participate directly in the Democratic Party and elect delegates to represent us at the Democratic National Convention in N.C. in September 2012. This is a big event for us and we are looking for volunteers to help us by joining the Global Primary Planning Committee. Email chair@democrats.ch for more info. 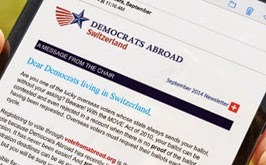 Democrats Abroad Switzerland is an all-volunteer organization. We exist and thrive ONLY because of the dedication and generosity of many of our members. So at this Holiday Season, we extend our sincere thanks to all of you who have volunteered for DA Switzerland in this past year. You have helped us to sustain a sense of community, and enhanced the lives of your fellow Americans around Switzerland. We are grateful to you all. Democrats Abroad Switzerland wishes you and your family a wonderful holiday season and Happy New Year!